Knit a striped and textured scarf to practice your knitting technique. This knitted scarf pattern varies in texture, as well as colors. A striped scarf is the classic knitted item. You can follow the pattern given here by using the suggested yarns, or you can substitute yarns from your own collection. Using Color A, cast on 30 sts and work 6 rows in garter stitch. With Color A, work 8 rows in St st (knit on RS rows, purl on WS rows). With Color B, work 2 rows in St st.
With Color C, work 2 rows in St st.
With Color D, work 6 rows in St st.
With Color E, work 4 rows in St st.
With Color A, work 7 rows in St st and 4 rows in garter stitch. With Color D, work 13 rows in St st.
With Color C, work 4 rows in St st and 6 rows in garter stitch. With Color A, work 6 rows in St st.
Repeat the stripe pattern 2 more times. You should have a total of three repeats. 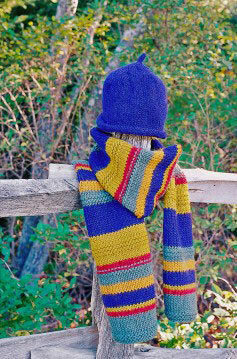 End the scarf by working 6 rows in garter stitch in Color A.
Weave in the ends horizontally along color change lines.